I came to bed tonight and found this book on my side. The children read it with their father again for storey time tonight. This is a new favorite in our house having bought it for Father's Day (which was this past weekend in the Southern Hemisphere) but the anticipation of the day had the kids pre-gifting this to dad weeks ago. Darth Vader and Son by Jeffrey Brown has an old-school quality depicting characters from the original three movies and intertwines it with creative new scenarios that would be part of the Skywalker's daily family life. Dealing with sisters, going to work with dad, schooling, playing, and all the other aspects of a pretty normal life of a father and son but it's Darth and four year old Luke. The illustrations are clean and colorful displaying images that are both familiar and hilarious. With each page turned you will vividly recognize scenes from the movies redone to amuse and entertain the entire family. We all laughed but did edit what pages we read with them. We have varying ages but our nine year old gets the most out of it. He laughs non-stop and we have noticed him choosing this one for silent reading. 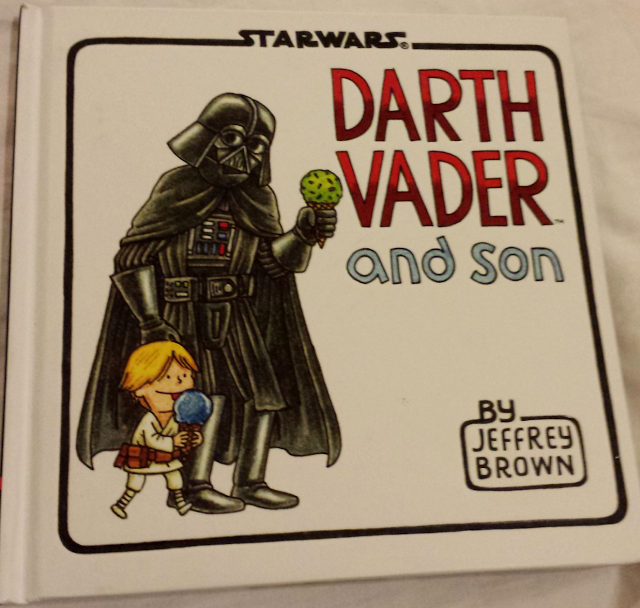 In short, fathers and sons who are Star Wars fans will want to add this very funny and fresh book to their collection. It's off the beaten Star Wars path and defines a generation of devotees that are passing the Holy Trilogy on to their children. That includes us. Happy Reading!